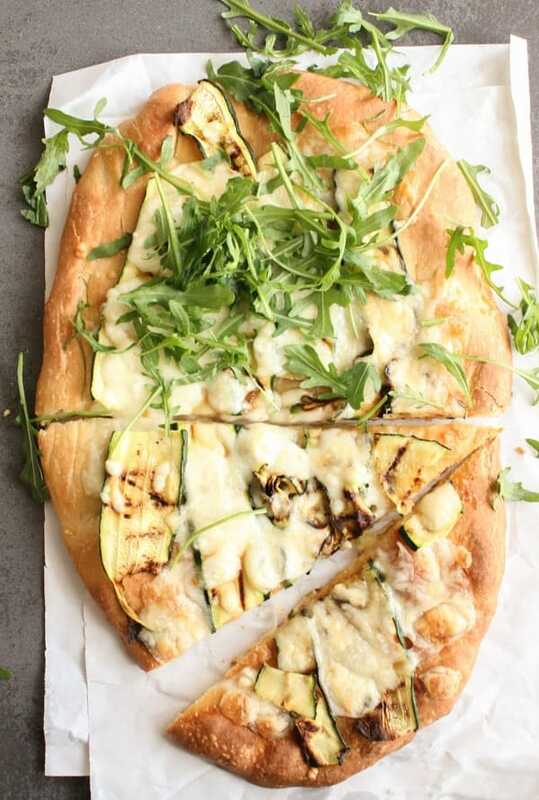 Grilled Zucchini Pizza is a simple delicious easy pizza, made with mozzarella and fresh Arugula. Make it with either homemade or store bought pizza dough. Well, I can now say that the Christmas Holidays after today are finished. Today is another big holiday in Italy The Epiphany (Befana). This day was the visit of the Three Kings to the Christ child. This is also the day that children in Italy receive their stocking filled with small gifts and chocolates, delivered not by Santa Claus but by a witch named “La Befana”, legend has it, that she flies around looking for the baby Jesus and that is why she brings gifts to children. Or another good excuse to eat. 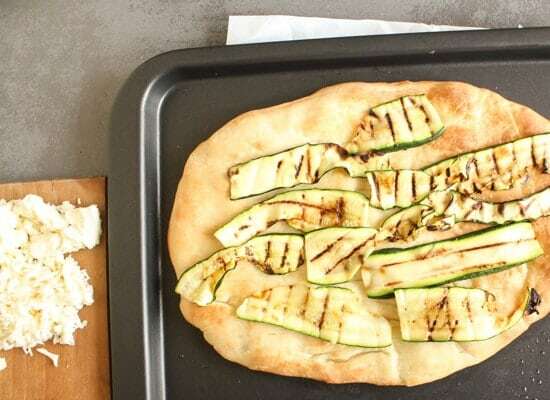 Although in Italy you never need an excuse to eat, especially a Grilled Zucchini Pizza.Tomorrow everything is back to normal and kids go back to school (my daughter not happy but mother is!). But today we will share a meal with family and friends. It’s almost what you could call a mini Christmas, but more relaxed. The usual Baked Pasta or Lasagna, a Meat Dish and of course Dessert will be served. It’s amazing sometimes how much can change in a year. Last year we were four under one roof. This year with our eldest daughter in Canada we are three. Last year my mother-in-law was in perfect health, this year not so much. So we will eat together with a few friends and family members. A lighter lunch will be served. Before I came to Italy when I thought of Pizza it was always Pizza with a tomato sauce base. Since I have been in Italy I have come to love a White Pizza, which means no tomato sauce, just mozzarella cheese. 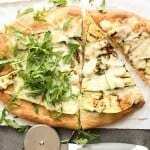 White pizza or what we love to eat, which is a Grilled Zucchini Pizza, a favourite here. 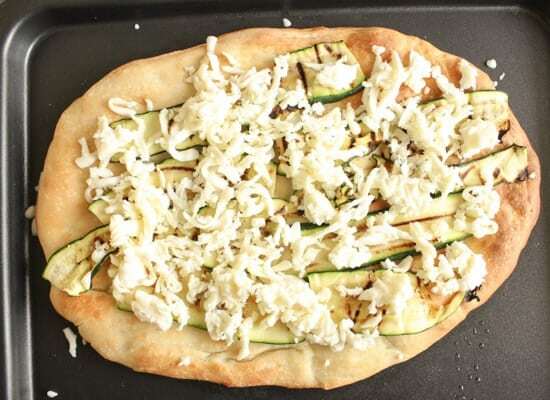 A delicious Pizza Dough drizzled with a little olive oil, baked until golden, then topped with slices of grilled zucchini and shredded mozzarella and returned to the oven until the cheese is melted to perfection. When it is finished baking I love to top it with some shredded raw rucola (rocket salad.) It’s a very yummy pizza, a must try. Buon Appetito! Makes 2-3 pizzas depending on size, PRE-MADE STORE BOUGHT OR BAKERY/PIZZERIA PIZZA DOUGH CAN BE USED. In a large bowl add warm water then add yeast and sugar, let sit for 2-3 minutes, then stir to combine. Add the olive oil, flour and salt, with a fork mix till dough starts to come together. On a lightly floured surface remove dough from the bowl and knead until dough is smooth and elastic approximately 10 minutes (if dough is really sticky add a little extra flour). Place in a lightly oiled bowl and cover with a folded up tablecloth (tea towels are too small), leave in a warm draft-free place till doubled in bulk, approximately 1-2 hours. 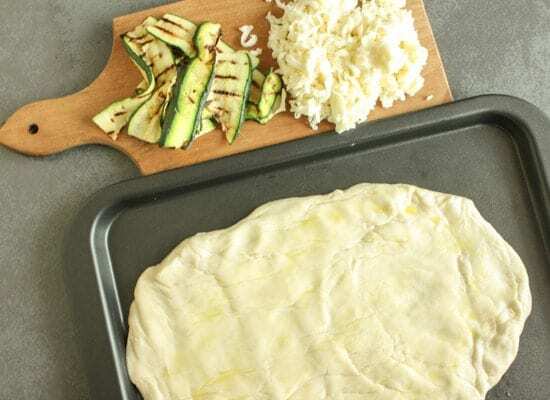 Punch dough down a few times and divide into pizza pans, without rolling it out, let it sit for 10 minutes, then roll or using hands form into desired shape (round,oblong,square). (If using pre-made dough place directly on greased cookie sheet and continue ) Place on lightly greased cookie sheet drizzle with olive oil and bake for approximately 12 minutes or until golden, remove from oven and top with grilled zucchini, and shredded cheese, continue to bake for another 3-5 minutes or until cheese has melted, top with shredded rucola (rocket) if desired, slice and serve immediately. Enjoy! it really looks yummy i gonna try that. Hi Thembo, thanks so much I hope you enjoy it! 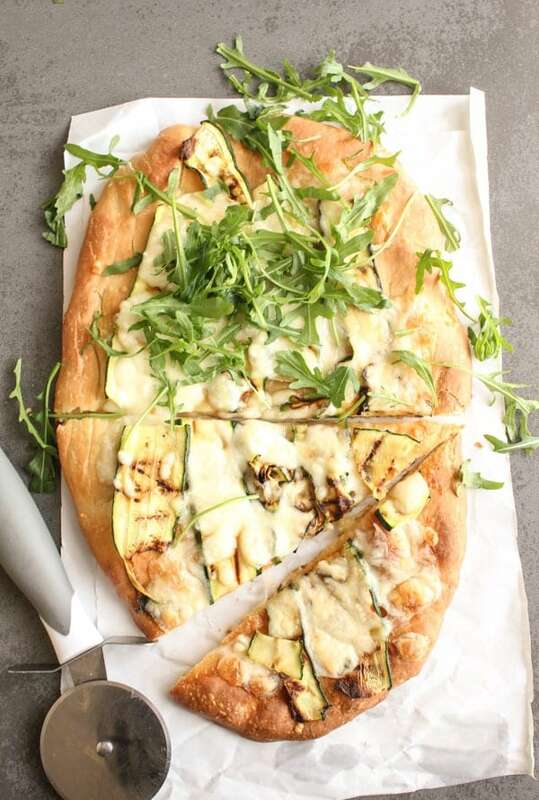 I LOVE zucchini on my pizza, and this looks like a great version. Now I need to get pizza dough and zucchini on my grocery list! Hi Dee Dee, thanks, it is really good, hope you enjoy it. That looks awesome! 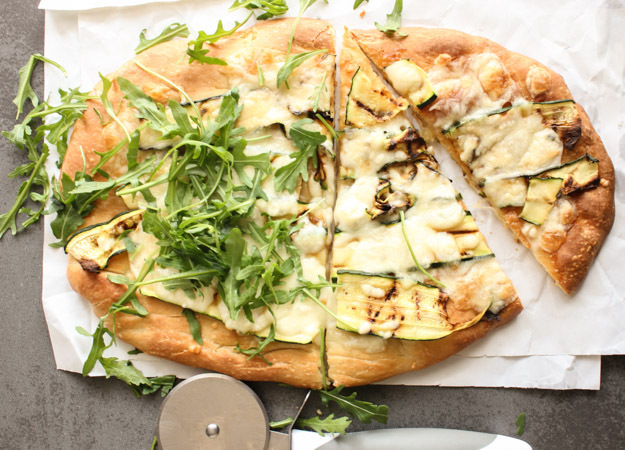 I love zucchini so this pizza would be perfect! Hi Liz thanks it is really good, let me know what you think. Have a great weekend. Hi Nina, thanks hope you like it. 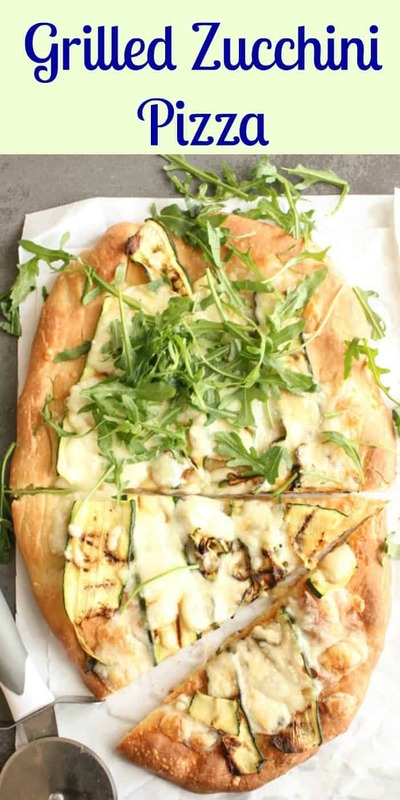 Never thought about putting the grilled Zucchini on pizza it never lasts that long, but yummy. Thanks for sharing on Thursday Favorite things. Hi Rosemary. I made up a shopping list this morning and put zucchini on it. Aside from using a spiralizer so that I can use them in place of pasta, I’m going to try this recipe. Looks yummy. Hi Ann, zucchini noodles are so good, hope you enjoy the pizza. Have a great day.